We’re still in the midst of the Marie Prevost Project, and we’ve jumped all the way from Marie’s 1916 short “A Scoundrel’s Toll” to one made two years later, “His Hidden Purpose.” It’s evident from Marie’s role in the film that, by 1918, she was a Sennett star. Many Sennett shorts — at least the ones I’ve seen — involve a few lead actors in the main plot with Beauties (or Kops or some similar group of slapstickians) in a secondary wacky plot. While researching, I’ve noticed that some people get very, very touchy if you refer to the female lead as a Beauty if she’s not strictly in a Beauty role, and Gloria Swanson apparently denied she was ever a Bathing Beauty. In the Beauties’ heyday, they were definitely considered second-tier actresses, background fluff at best; here, nearly a century later, many still feel the same way. I don’t really know what to make of that. It’s interesting to see these movies in order and realize that Marie started out as a background Beauty but was promoted to lead actress in short order. 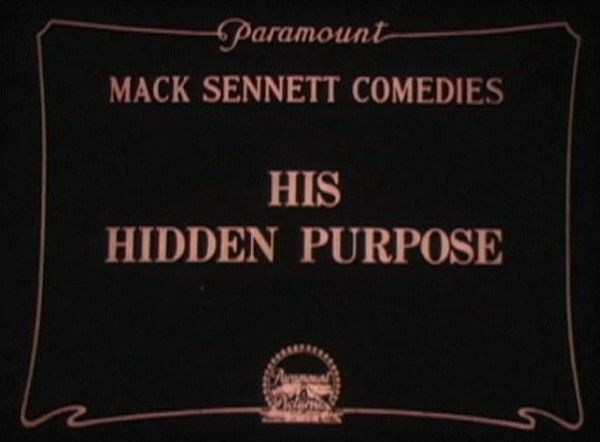 Released 2 1/2 years after her (allegedly) first film in “Those Bitter Sweets,” it appears that “His Hidden Purpose” was Marie’s first starring role in a Sennett short. And folks, she is adorable. This cat is cross-eyed with rage. I wish I could tell you what “His Hidden Purpose” is about, but this short is a difficult and confusing 12 minutes. The editing is so rapid that it occasionally becomes subliminal, especially the wacky chase scene which often is nothing more than a series of inexplicable flashes on the screen. The movie starts out just fine, with Marie as The Girl in the Case, in love with Neal Burns, “Her Sweetheart.” But her dad wants her to marry someone else (Chester Conklin) and takes her away on vacation to get her away from Her Sweetheart. He follows them, disguised as a widow. There is a genuinely funny scene where Marie is disguised as a man to go meet her boyfriend disguised as a widow, and slapstick happens which results in Chester being found in his underpants with the widow in a barn. It’s worse than you think: Chester falls for the widow. Then a criminal arrives played by Cliff Bowes, credited as An Innocent Convict but not portrayed as “innocent” as far as I can tell. To elude the cops, he sees Her Sweetheart and gets the idea to dress as the widow himself. Chester decides to take the widow to elope, and grabs the criminal instead of Neal. Someone else takes Marie and whisks her away. I don’t know who it is, just some skinny guy at the vacation/summer home place. It may be George Binns, a 30-something actor who was in a few Sennett films until he died a few months after this film was made. Marie’s father and Neal follow in hot pursuit of, well, everyone. Behind the scenes photo during filming of “His Hidden Purpose,” courtesy of Louie at elbrendel.com. That’s the point where the car chase scene becomes so confusing that I can’t tell who is doing what. I believe there are four vehicles: One with Marie’s father and someone who may or may not be Neal, one with three unidentified men in it, a motorcycle with Marie and that skinny guy, and a car with Al and the criminal he thinks is a widow. They all arrive at a justice of the peace at the same time, a scuffle ensues, and I think everyone gets married to the right people. Again, I am not sure. Marriage happens, that’s all I know. But you briefly get to see Marie in a tuxedo, which is well worth the price of admission. Status: Released on January 27, 1918. Exists and is available on DVD from Sunrise Silents as an extra on “Skinner’s Dress Suit”. For more details, read here. Thank you for understanding. Next Post Bette Davis Project: Pretty, Pretty Pictures! 1918 – that was almost 100 years ago. Can you believe that??? Your level of research on these posts amazes me. I’m glad you’re blogging about essentially forgotten films. People should know there’s more out there than what is at Blockbuster! I’ll have to check out Sunrise Silents. 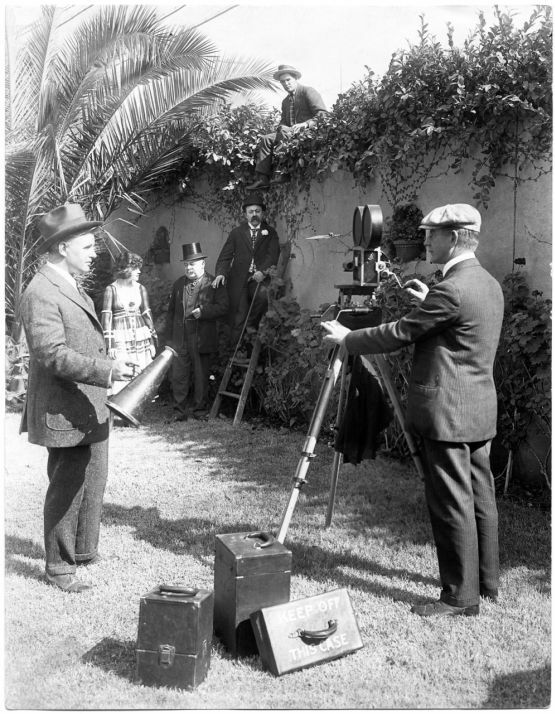 I’d been wondering how to get copies of hard-to-find silent films. Thanks Cathy. It’s actually kind of frustrating, because on one hand, there are a lot of topics where something happening 100 years ago would not be hard to research. With film, though, enormous chunks of history are lost or semi-lost. Lauren, I definitely recommend Sunrise, but also Kino and Grapevine Video and Flicker Alley. All great places to get nice copies of rare films. I just realized that “His Hidden Purpose” can be taken as a naughty joke about the guy in drag. Cheeky!